U.K. based band Nothing But Thieves have released their new single “Sorry”, along with the music video. The track is off the band’s sophomore album entitled Broken Machine, which is set for release September 8th, 2017 via Sony Music U.K./RCA Records. Pre-order the album here and watch the band’s new music video below. 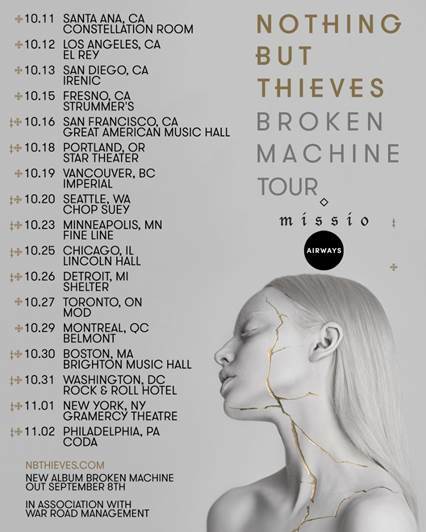 Additionally, the band has announced their U.S. headlining “Broken Machine Tour” in support of their upcoming album with support from MISSIO and Airways. Fans who pre-order the album will get first access to the artist pre-sale, which begins on Monday, July 24th at 10am local time. General on sale will be July 28th at 10am local time and can be purchased here. See full list of tour dates below.